John Maynard Keynes’s 1936 book The General Theory of Employment, Interest, and Money attempted to overthrow classical theory and revolutionize how economists think about the economy. Economists who build upon Keynes’s General Theory to analyze the economic problems of the twenty-first-century global economy are called Post Keynesians. Keynes’s “principle of effective demand” (1936, chap. 2) declared that the axioms underlying classical theory were not applicable to a money-using, entrepreneurial economic system. Consequently, the mainstream theory’s “teaching is misleading and disastrous if we attempt to apply it to the facts of experience” (Keynes 1936, p. 3). To develop an economic theory applicable to a monetary economy, Keynes suggested rejecting three basic axioms of classical economics (1936, p. 16). •Money matters in the long and short run, that is, changes in the money supply can affect decisions that determine the level of employment and real economic output. •As the economic system moves from an irrevocable past to an uncertain future, decision makers recognize that they make important, costly decisions in uncertain conditions where reliable, rational calculations regarding the future are impossible. •People and organizations enter into monetary contracts. These money contracts are a human institution developed to efficiently organize time-consuming production and exchange processes. The money-wage contract is the most ubiquitous of these contracts. •Unemployment, rather than full employment, is a common laissez-faire situation in a market-oriented, monetary production economy. •The ergodic axiom postulates that all future events are actuarially certain, that is, that the future can be accurately forecasted from an analysis of existing market data. Consequently, this axiom implies that income earned at any employment level is entirely spent either on produced goods for today’s consumption or on buying investment goods that will be used to produce goods for the (known) future consumption of today’s savers. In other words, orthodox theory assumes that all income is always immediately spent on producibles, so there is never a lack of effective demand for things that industry can produce at full employment … Post Keynesian theory rejects the ergodic axiom. In Post Keynesian theory … people recognize that the future is uncertain (nonergodic) and cannot be reliably predicted. The financial crisis of 2007-08 hit most laymen and economists with surprise. What was it that went wrong with our macroeconomic models, since they obviously did not foresee the collapse or even made it conceivable? There are many who have ventured to answer that question. And they have come up with a variety of answers, ranging from the exaggerated mathematization of economics, to irrational and corrupt politicians. But the root of our problem goes much deeper. It ultimately goes back to how we look upon the data we are handling. In ‘modern’ macroeconomics — Dynamic Stochastic General Equilibrium, New Synthesis, New Classical and New ‘Keynesian’ — variables are treated as if drawn from a known “data-generating process” that unfolds over time and on which we therefore have access to heaps of historical time-series. If we do not assume that we know the ‘data-generating process’ – if we do not have the ‘true’ model – the whole edifice collapses. And of course it has to. I mean, who honestly believes that we should have access to this mythical Holy Grail, the data-generating process? In the end this is what it all boils down to. We all know that many activities, relations, processes and events are of the Keynesian uncertainty-type. The data do not unequivocally single out one decision as the only ‘rational’ one. Neither the economist, nor the deciding individual, can fully pre-specify how people will decide when facing uncertainties and ambiguities that are ontological facts of the way the world works. A couple of years ago, in a lecture on the US recession, Robert Lucas gave an outline of what the new classical school of macroeconomics today thinks on the latest downturns in the US economy and its future prospects. In a rather cavalier manner – without a hint of argument or presentation of empirical facts — Lucas dismisses even the possibility of a shortfall of demand. For someone who already 30 years ago proclaimed Keynesianism dead — “people don’t take Keynesian theorizing seriously anymore; the audience starts to whisper and giggle to one another” – this is of course only what could be expected. Demand considerations are simply ruled out on whimsical theoretical-ideological grounds, much like we have seen other neo-liberal economists do over and over again in their attempts to explain away the fact that the latest economic crises shows how the markets have failed to deliver. If there is a problem with the economy, the true cause has to be government. Chicago economics is a dangerous pseudo-scientific zombie ideology that ultimately relies on the poor having to pay for the mistakes of the rich. Trying to explain business cycles in terms of rational expectations has failed blatantly. Maybe it would be asking too much of freshwater economists like Lucas and Cochrane to concede that, but it’s still a fact that ought to be embarrassing. My rational expectation is that 30 years from now, no one will know who Robert Lucas or John Cochrane was. John Maynard Keynes, on the other hand, will still be known as one of the masters of economics. Today is Mother’s Day in Sweden. This one is in loving memory of my mother Lisbeth, and of Kristina, beloved wife and mother of David and Tora. Modern economics has become increasingly irrelevant to the understanding of the real world. The main reason for this irrelevance is the failure of economists to match their deductive-axiomatic methods with their subject. In mainstream neoclassical economics internal validity is almost everything and external validity next to nothing. Why anyone should be interested in that kind of theories and models is beyond yours truly’s imagination. As long as mainstream economists do not come up with export licenses for their theories and models to the real world in which we live, they really should not be surprised if people say that this is not science, but autism. Econometric patterns should never be seen as anything else than possible clues to follow. Behind observable data there are real structures and mechanisms operating, things that are — if we really want to understand, explain and (possibly) predict things in the real world — more important to get hold of than to simply correlate and regress observable variables. 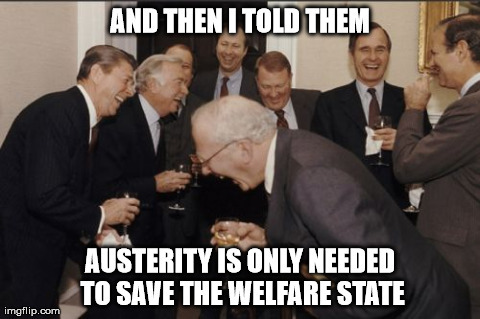 Just face it — austerity policies do not work! An analogy can help to make the point clearer: it is as if a person had asked for an antibiotic for his fever, and been given a mixed tablet with antibiotic and rat poison. You cannot have the antibiotic without also having the rat poison. We were in effect being told that if you want economic reform then you must also have, along with it, economic austerity, although there is absolutely no reason whatsoever why the two must be put together as a chemical compound. We are not going to get out of the present economic doldrums as long as we continue to be obsessed with the insane idea that austerity is the universal medicine. When an economy is already hanging on the ropes, you can’t just cut government spendings. Cutting government expenditures reduces the aggregate demand. Lower aggregate demand means lower tax revenues. Lower tax revenues means increased deficits — and calls for even more austerity. And so on, and so on. I used to laugh at my kids when they behaved like this when in kindergarten. I can’t but grieve for a nation that has given us presidents like George Washington, Thomas Jefferson, Abraham Lincoln, and Franklin D. Roosevelt, and now is run by a witless clown. An absolute disgrace. Expansionary austerity? You gotta be kidding! 25 maj, 2017 kl. 18:19 | Publicerat i Economics | Kommentarer inaktiverade för Expansionary austerity? You gotta be kidding! This example illustrates three lessons. First, researchers shouldn’t blindly follow convention in picking an appropriate p-value cutoff. Second, in order to choose the right p-value threshold, they need to know how the threshold affects the probability of a Type II error. Finally, they should consider, as best they can, the costs associated with the two kinds of errors. Statistics is a powerful tool. But, like any powerful tool, it can’t be used the same way in all situations. Good lessons indeed — underlining how important it is not to equate science with statistical calculation. All science entail human judgement, and using statistical models doesn’t relieve us of that necessity. Working with misspecified models, the scientific value of significance testing is actually zero – even though you’re making valid statistical inferences! Statistical models and concomitant significance tests are no substitutes for doing science. And as shown over and over again when it is applied, people have a tendency to read “not disconfirmed” as ‘probably confirmed.’ Standard scientific methodology tells us that when there is only say a 10 % probability that pure sampling error could account for the observed difference between the data and the null hypothesis, it would be more ‘reasonable’ to conclude that we have a case of disconfirmation. Especially if we perform many independent tests of our hypothesis and they all give about the same 10 % result as our reported one, I guess most researchers would count the hypothesis as even more disconfirmed. We should never forget that the underlying parameters we use when performing significance tests are model constructions. Our p-values mean next to nothing if the model is wrong. And most importantly — statistical significance tests DO NOT validate models! Yes, indeed. Forgetting — or at least pretending to forget — that third possibility, turns much of ‘modern’ economics and econometrics into post-real blah blah blah pseudo-science. Many say or think that there were problems in the financial system that gave rise to the Great Depression. We’ve looked at that in a systematic way using modern theory. And we found that businesses had all kinds of money to invest, and they didn’t. They increased distributions to owners. Why? The answer is that businesses did not perceive they had profitable investment opportunities. I don’t think financial crises are a big deal. Yes, indeed, modern mainstream economics — and especially its mathematical-statistical operationalization in the form of econometrics — fails miserably over and over again. One reason why it does, is that the error term in the regression models used are thought of as representing the effect of the variables that were omitted from the models. The error term is somehow thought to be a ‘cover-all’ term representing omitted content in the model and necessary to include to ‘save’ the assumed deterministic relation between the other random variables included in the model. Error terms are usually assumed to be orthogonal (uncorrelated) to the explanatory variables. But since they are unobservable, they are also impossible to empirically test. And without justification of the orthogonality assumption, there is as a rule nothing to ensure identifiability. In mainstream econometrics the error term is usually portrayed as representing the combined effect of the variables that are omitted from the model. What one does not say — in a way bordering on intellectual dishonesty — is that this assumption only works when (1) the combined effect is independent of each and every variable included in the model, and (2) the expectational value of the combined effect equals zero. And that is something almost never fulfilled in real world settings! Conclusion: an economic theory or model that doesn’t pass the real world smell-test is just silly nonsense that doesn’t deserve our attention and therefore belongs in the dustbin. Rational expectations — not to mention effective market hypotheses, NAIRU, and DSGE models — immediately comes to mind. 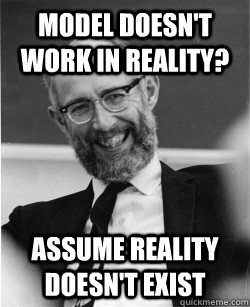 Those who want to build macroeconomics on microfoundations usually maintain that the only robust policies and institutions are those based on rational expectations and representative actors. As I tried to show in my paper Rational expectations — a fallacious foundation for macroeconomics in a non-ergodic world there is really no support for this conviction at all. On the contrary. If we want to have anything of interest to say on real economies, financial crisis and the decisions and choices real people make, it is high time to place macroeconomic models building on representative actors and rational expectations-microfoundations where they belong — in the dustbin. Austerity policies not only generate substantial welfare costs due to supply-side channels, they also hurt demand — and thus worsen employment and unemployment.The notion that fiscal consolidations can be expansionary (that is, raise output and employment), in part by raising private sector confidence and investment, has been championed by, among others, Harvard economist Alberto Alesina in the academic world and by former European Central Bank President Jean-Claude Trichet in the policy arena. However, in practice, episodes of fiscal consolidation have been followed, on average, by drops rather than by expansions in output. On average, a consolidation of 1 percent of GDP increases the long-term unemployment rate by 0.6 percentage point and raises by 1.5 percent within five years the Gini measure of income inequality …. The evidence of the economic damage from inequality suggests that policymakers should be more open to redistribution than they are. Of course, apart from redistribution, policies could be designed to mitigate some of the impacts in advance—for instance, through increased spending on education and training, which expands equality of opportunity (so-called predistribution policies). And fiscal con- solidation strategies—when they are needed—could be designed to minimize the adverse impact on low-income groups. But in some cases, the untoward distributional consequences will have to be remedied after they occur by using taxes and government spending to redistribute income. Fortunately, the fear that such policies will themselves necessarily hurt growth is unfounded. Tänk om det var något med själva kartan. Själva teorin och modellen … Snabbt blev det uppenbart för mig att många av teorierna och modellerna bakom den dominerande ekonomiska politiken inte alls var så objektiva, vetenskapligt robusta och okontro-versiella som de ofta presenters som. Inte heller verkar nationalekonomin stå så frikopplad från det politiska som man kan förledas att tro. En klart läsvärd (med undantag för kapitlet om Pikettys ”miss”) kritik av mycket som är galet inom dagens nationalekonomi. It’s time to tax the Wall Street casino! These tendencies are a scarcely avoidable outcome of our having successfully organised “liquid” investment markets. It is usually agreed that casinos should, in the public interest, be inaccessible and expensive. And perhaps the same is true of Stock Exchanges … The introduction of a substantial Government transfer tax on all transactions might prove the most serviceable reform available, with a view to mitigating the predominance of speculation over enterprise in the United States.